This tour has met its minimum and is cleared for guests to purchase airfare. On this tour, guests spend two nights on Iona – a mystical, spiritual thin place that is unmatched for beauty and spiritual energy. On one of the two days spent on Iona, guests will be able to venture out to Staffa – a pillar island with rare seabirds and amazing rock formations that mirror the Giant’s Causeway in Northern Ireland. Staffa also has a sea cave with acoustics that produce a melodious musical sound. Guests will also enjoy a scenic drive across the Isle of Mull with its mountains, shadows, brilliant colors, and picturesque villages. 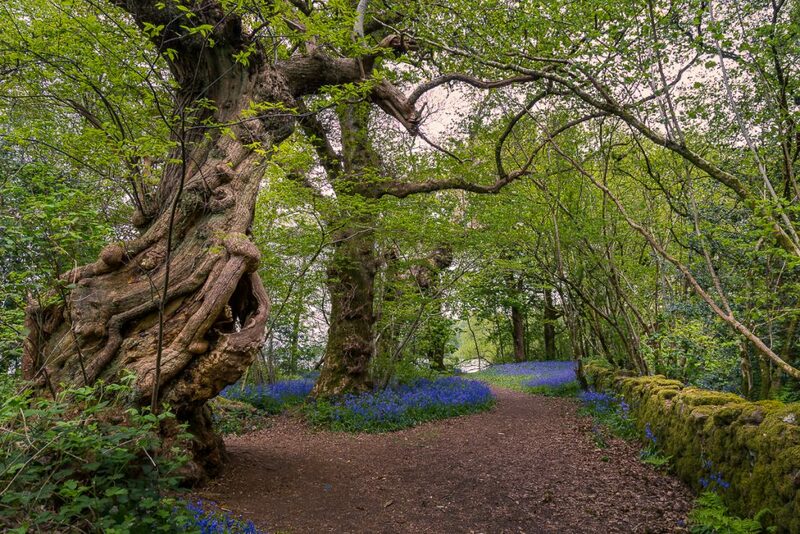 On the first day, guests will take a short boat ride across the Lake of Menteith and visit Inchmahome (Island of my Home), a small island with the ruins of a monastery – one that sheltered little Mary Queen of Scots when her mother placed her in hiding for her protection. This island has an ancient forest with 500-year-old Spanish Chestnuts. The woodland is enchanting. On the final day of this tour, guests will visit Holy Island – also known as Lindisfarne – an island twice a day at high tide, set in the North Sea on the east coast of Northumberland – the borderlands between England and Scotland. 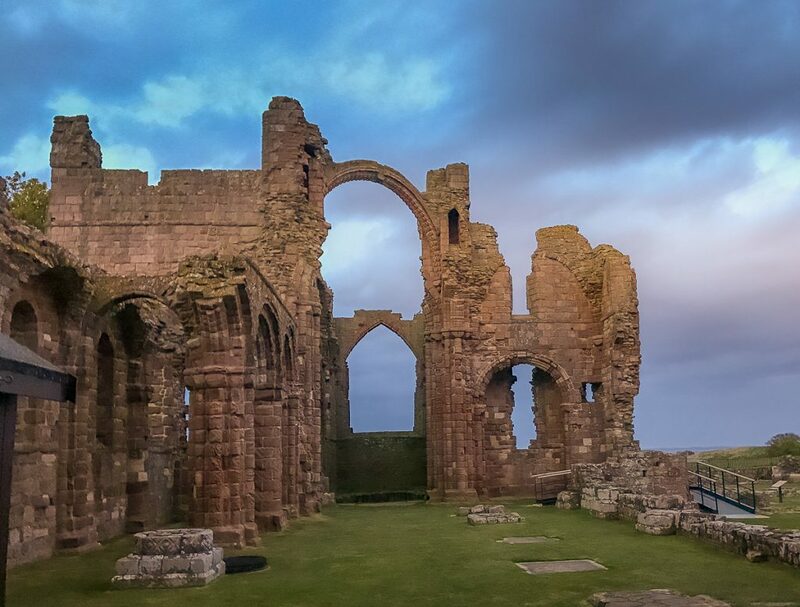 Lindisfarne is as magical as Iona with its ruins of the old abbey founded by St. Aidan, Cuthbert’s Isle, Lindisfarne Castle, a labyrinth, walled gardens, sea glass beach, and islanders with many stories to tell. The tour moves within the context of the old stories of the monks of Iona who followed a sacred trail forged by kings, queens and the ancient pre-Christian people of Scotland and England. 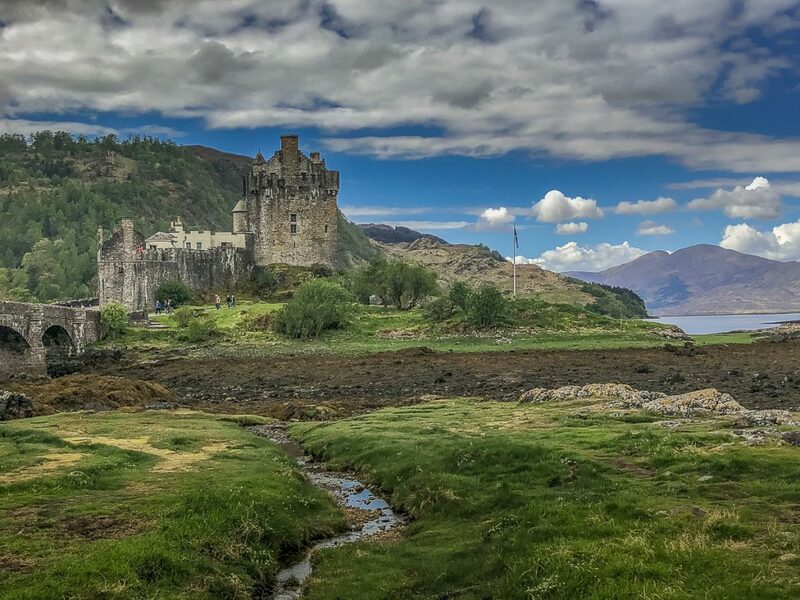 The tour also diverts to some of the stunning scenery of the Scottish Highlands with a visit to Glencoe and the Kilmartin Valley, the home of Dunadd Fort and the largest collection of ancient monuments in Scotland. Guests will also visit Doune Castle (filming site for Game of Thrones and the Outlander Series) and Rosslyn Chapel (made famous by The DaVinci Code), Melrose Abbey and Jedburgh Abbey. FILMING LOCATIONS – the tour will visit Doune Castle, which was featured as Winterfell in the pilot episode of Game of Thrones, and also featured as Castle Leoch in The Outlander series. Glencoe has been a filming site for the movies Braveheart, Rob Roy, and several Harry Potter movies. Rosslyn Chapel was featured in both the book and the film, The DaVinci Code. This tour will be 8 packed days of visiting majestic ruins of monastic settlements, castles, passage tombs, stone circles, fairy hills and trees, and sacred sites with powerful energy with one day completely free to relax and explore Scotland’s capital city at leisure. Evenings are also free to explore at leisure. Overnights are Lake of Menteith (1 night), Iona (2 nights), Oban (2 nights), Lindisfarne vicinity (1 night), Edinburgh (2 nights city center – 1 night near EDI Airport). Guests will also be given a demonstration on how to dowse for energy lines with dowsing rods and pendulums. Scotland’s stunning scenery alone is worth the visit. But a visit to these thin places in Scotland with this itinerary is not duplicated anywhere. The focus of all our tours is “thin places” or places where the veil between this world and the eternal world is thin… where both worlds are woven together. And as on all of our tours, you’ll see the unspoiled hidden places few visitors ever see on other commercial tours. You’ll be traveling within the context of a story while peeping into the ancient past of mystical hills, stone circles, passage tombs, holy wells, monastic ruins, castle ruins, and archeological wonders. Guests will have the opportunity to connect with the ancient landscape and draw from it that old wisdom that is unique to Scotland. A full-time tour guide will be with the tour from start to finish as will a coach driver. 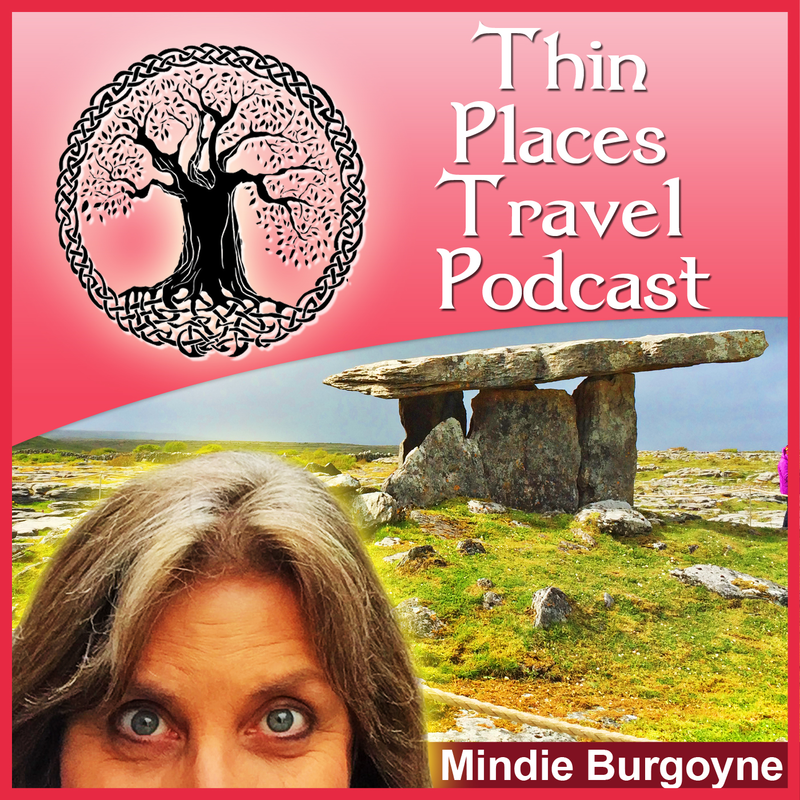 The guide will be Mindie Burgoyne, tour operator and owner of Thin Places Mystical Tours. She has a long history of investigating thin places in Western Europe and an understanding of earth energies and the power of spiritual pilgrimage. Overnights will be in Iona, Lindisfarne, Oban, Lake of Menteith, and Edinburgh. Four dinners – Welcome and Farewell dinners on the first and last nights, plus one dinner in Iona and one in Oban. Ferry tickets for 4 island excursions. Ground Transportation – We enjoy the comfort of our own motorcoach for the entire 10 days. 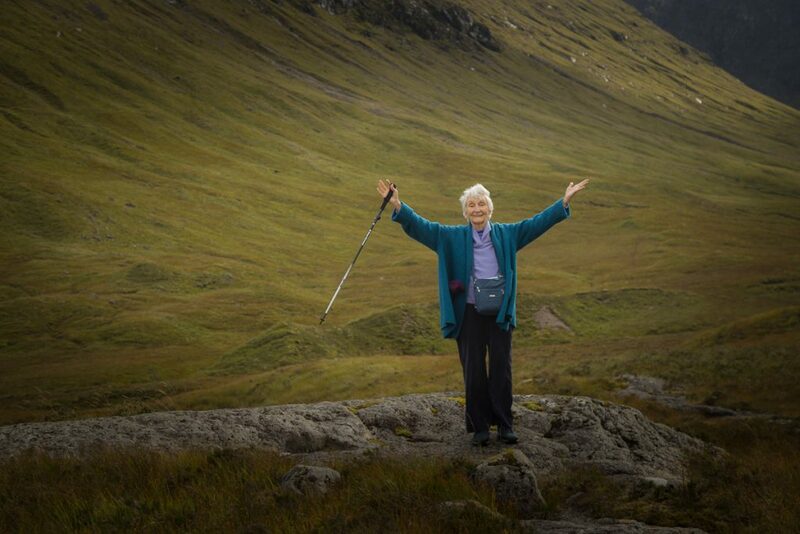 Guests are free to leave things they use daily (walking sticks, jackets, etc) on the bus. The bus may also include an onboard bathroom and wifi (depending on the size of the tour group). FREE DAY in Edinburgh – The 7th day of the tour, unwind in your hotel – Fraser Suites – one block off of the Royal Mile. 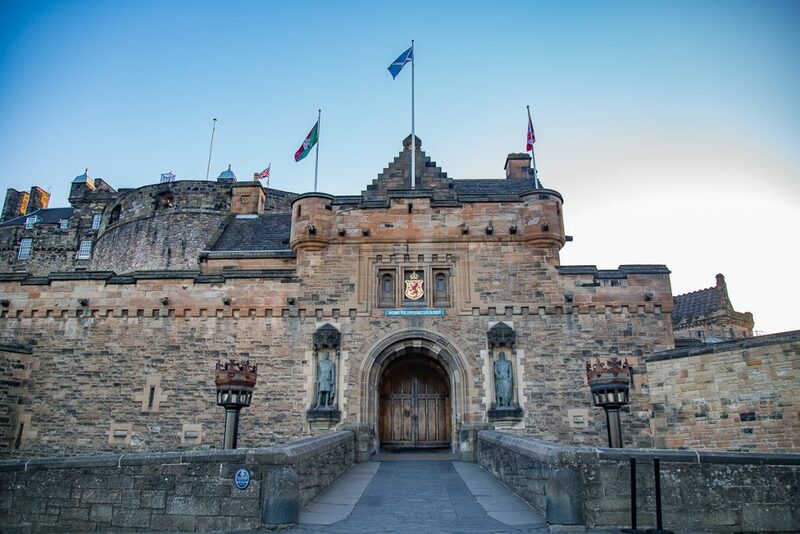 Use your Explorer Pass (provided by Thin Places Tours) to visit Edinburgh Castle. Walk the mile to see Arthur’s Seat, Holyrood Palace, St. Giles Cathedral, the Scottish Storytelling Museum or some of the other amazing stops on this one-mile road. Airfare is not included. Guests must arrange their own airfare to and from Edinburgh International Airport. TOUR START and END – The tour begins when the tour guide and coach driver meet the guests at Edinburgh International Airport (EDI) at 10 am on May 10th. Guests are responsible for getting themselves to EDI at that time in order to meet the tour. A map and exact location will be provided. The tour ends with a farewell dinner and overnight at a hotel near Edinburgh Airport on May 18th (the 9th day). From there, guests can either extend their stays or get a taxi to the airport the following morning (May 19th). Thin Places Mystical Tours staff can help guests arrange to extend their stays after the tour or book pre-nights in Edinburgh before the tour begins if assistance is needed. Cost is $3299 (based on double occupancy) and is for the land only. It includes lodging, all breakfasts, four dinners, a group lunch, transportation, admissions, ferry passages, and private guides. Posts about some of the sites will appear periodically on the Thin Places blog. All expenses are paid except airfare, lunches, 5 evening meals, and any incidental expenses unrelated to the group tours and accommodations. Travel Insurance – We suggest guests purchase travel insurance on their own. Thin Places Mystical Tours does not sell Travel Insurance or represent any travel insurance vendor, though we can make recommendations based on what other guests have used. After meeting your tour guide and coach at Edinburgh airport (EDI), guests will head for the Lake of Menteith and check into an award-winning boutique hotel on the lake voted Scotland’s “Small Country Hotel of the Year – 2017.” Then they’ll take a short boat ride over to Inchmahome (“Island of my home”) Island and explore the 13th-century ruins of an Augustinian Priory and walk the mystical forest among trees believed to date back to the 1500s. This was a place that once sheltered the child Mary Queen of Scots. Guests will walk in the old forest among the 700-year-old Spanish Chestnuts and feel the energy of this sacred island and forest. Then head back to the hotel on the lake and enjoy your welcome dinner. Overnight at the Lake of Menteith Hotel. 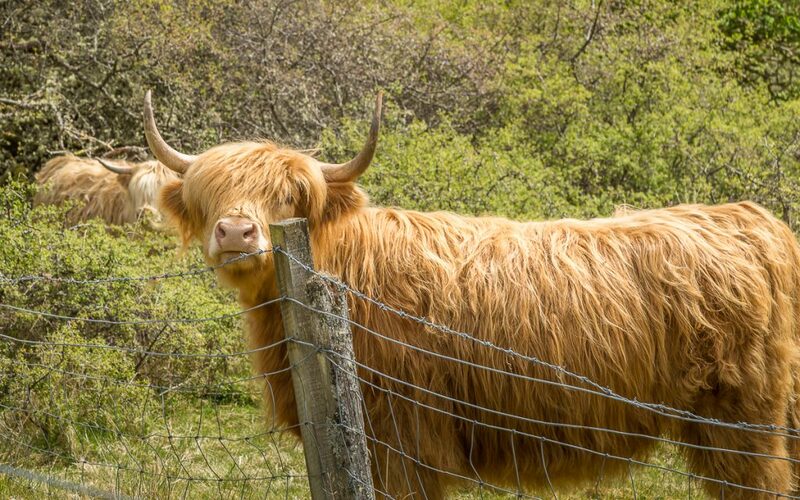 Guests will leave Lake of Menteith early and head for the Port of Oban where the bus will board a ferry to cross over onto the Island of Mull – the second largest island of the Inner Hebrides. You’ll hear stories of mystical patches that transcend our existence and take in the sweeping scenic views in Mull. Then guests board another (small) ferry and land on the Isle of Iona – a place many believe is suspended in time – sacred – existing in two worlds at once. This is where St. Columba founded his monastery in the sixth century and began converting the feisty Picts. Guests will participate in a short walking tour of the island and have a little free time to walk the beach before settling in at their hotel adjacent to Iona Abbey. One of the greatest features of spending a night on a remote island is a night walk under a massive starry sky. Overnight at St. Columba Hotel. There is nothing quite like waking up on a sacred island – an island that draws spiritual travelers from all over the world. Spend the day on Iona for private mediation or mingling with the Islanders. 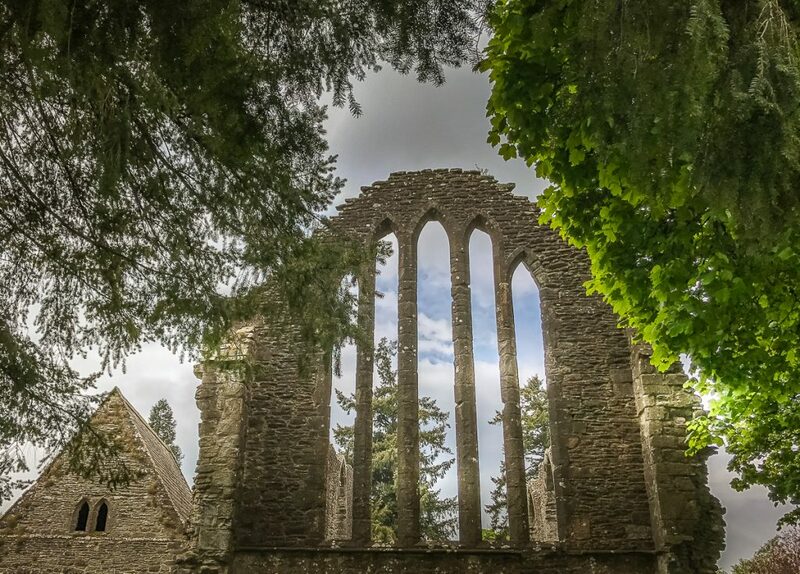 Guests can attend a service at Iona Abbey, walk a labyrinth, explore the beach, shop for books, crafts or art, or walk through the ruins of the old nunnery (with a Sheelagh na gig). At noon, guests can take a 3-hour tour (weather permitting) out to the island of Staffa to see Fingal’s Cave a sea cave with amazing natural acoustics. The 60 million-year-old island is named for Fionn mac Cumehaill (aka Finn MacCool, the mythological Irish giant) who is said to have built a causeway between Ireland and Scotland in order to have easy access for his warriors. The rock formations at Fingal’s Cave are similar to those hexagonal basalt columns found at the Giant’s Causeway in Northern Ireland. After returning from Staffa, guests can walk the beach and search form some of the green stones that Iona is known for. Then enjoy a group dinner. Perhaps take another night walk under the stars and listen to the sea breaking against the rocks. Guests will leave Iona in the early morning and head for the mainland. After lunch in Oban guests will take a drive out to Glencoe in the Scottish Highlands and enjoy the stunning views. 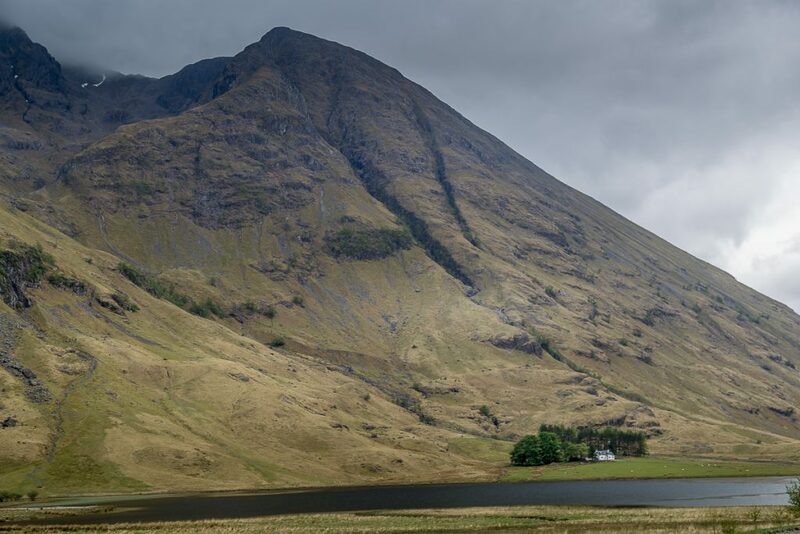 Glencoe is a haunted place where a terrible betrayal and massacre of thirty-eight McDonald clan members took place. It was the betrayal more than the murders of MacDonalds in their sleep that has kept this story alive for over three-hundred years. Take a short hike at the foot of the mountains, visit the village and the memorial. The guide will point out where Hagrid’s Hut was located in Harry Potter movies. Learn about the Isle of Discussion and see where the remote burial site of the McDonalds and other Glencoe clans. 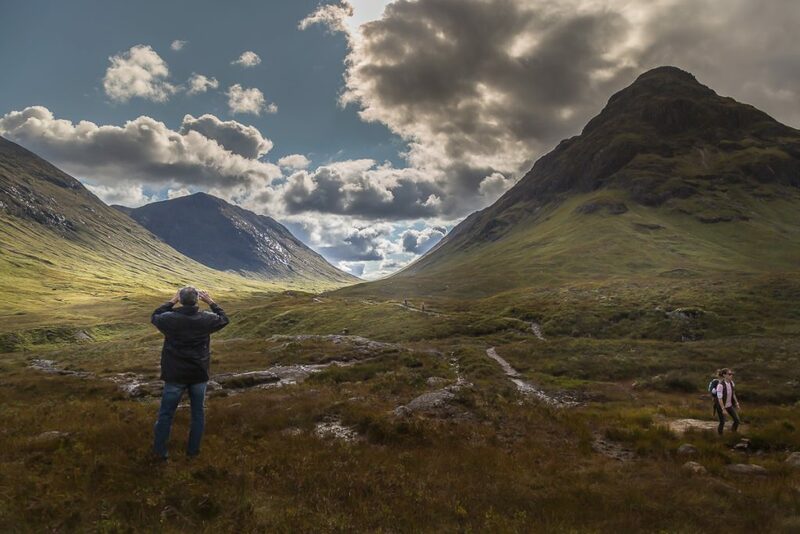 Glencoe is one of the most scenic places in Scotland – so scenic that it’s been the site of many films including Braveheart, Rob Roy, and Harry Potter and the Prisoner of Azkaban. 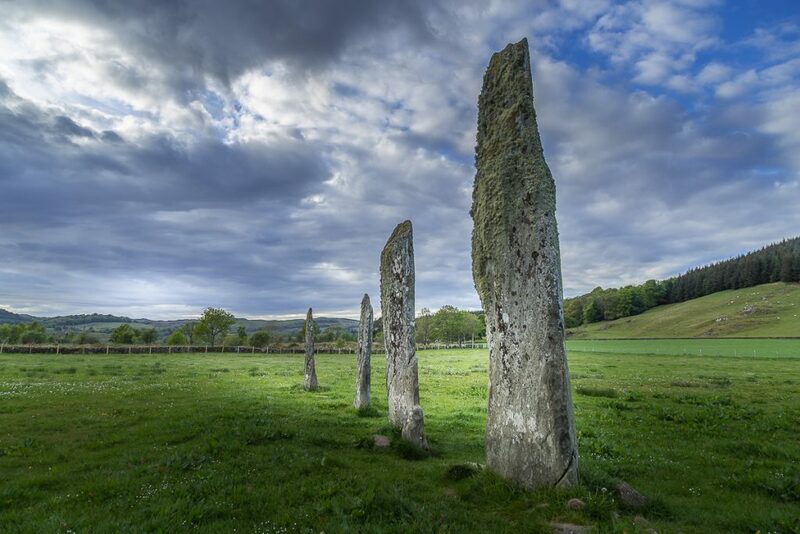 Guest will visit the Kilmartin Valley, a two-mile stretch in a valley that contains the largest concentration of ancient monuments in Scotland. Guests will start with a visit to Dunadd Fort – the royal center of Dál Riata where the first Scottish kings were crowned – and where St. Columba likely traveled to converse with an early king. Hear that story, place your foot on the inauguration stone and look out over the Kilmartin Glen – dotted with megaliths. Then take a walk through the glen where there are over 150 prehistoric monuments located within a 6-mile radius. This is one of the most important concentrations of Neolithic and Bronze age monuments in all of Scotland. Visit standing stones, tombs and stone circles. Enjoy a group lunch at the museum. On the way back to Oban, stop and look at the Kinstraw Standing Stone believed to once have been used to view the setting sun during over the Isle of Jura during the Winter Solstice. Overnight in or near Oban. CASTLES & FAIRIES – Explore the gateway to the otherworld of fairies at Doon Hill according to Rev. Robert Kirk, author of “The Secret Commonwealth of Elves, Fauns, and Fairies” in 1691. Rev. Kirk believed this hill was inhabited by the fairies and frequently conversed with them. He was allegedly taken by the fairies and later found dead on the hill. Today the hill and its forests are believed to be teeming with elementals. Then guests will head to the 14th century Doune Castle, a favorite Scottish castle for many visitors. Mary Queen of Scots, James VI, Charles Stewart, Queen Victoria were all important visitors. Doune Castle is now famous for being a location for so many award-winning shows including the Outlander series (Castle Leoch) and Game of Thrones (Winterfell). From there, guests will head to Edinburgh and check into their hotel on the Royal Mile. Guest can enjoy a free day in the Medieval City of Edinburgh. Since the hotel is on the Royal Mile guests will have easy walking access to Edinburgh Castle, Holyrood Palace and Abbey and all sites in between. Guests will visit this special island in Northumberland that is an island twice a day when the North Sea high tide rolls in. And similar to Mont San Michel in Brittany, this island has an abbey and a castle (though the abbey is a ruin and the castle is more contemporary). The views around “Holy Island,” as it is known, are subtle but spectacular in the spiritual sense. Guests may visit the monastic ruins, walk the sea glass beach, hear the stories of monks and princes and Vikings that have occupied the island, trek out to Cuthbert’s Isle for reflection and the views. Take a walk down to the castle, the Gertrude Jekyll garden. Birdwatch. Walk a labyrinth. Guests will never forget the special day in this most magical place. Overnight on or near Lindisfarne. 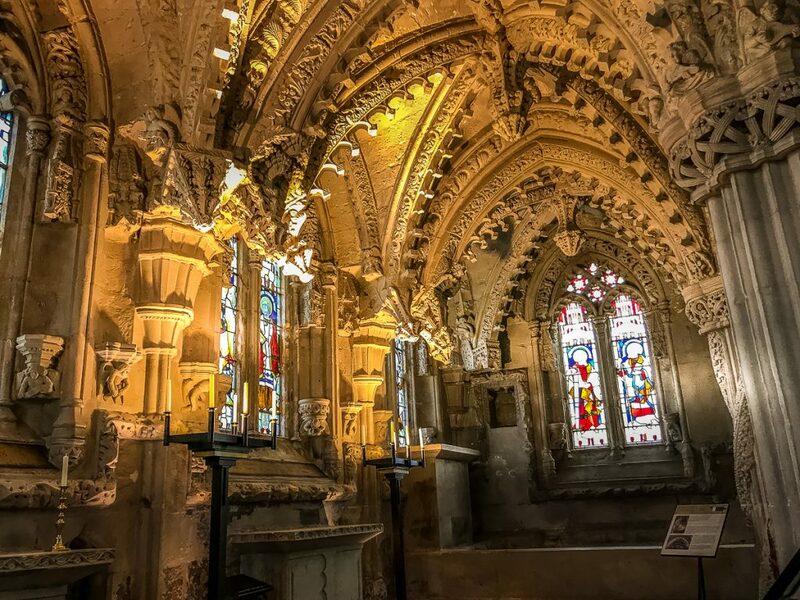 Guest will enjoy a visit to the mysterious Rosslyn Chapel where some believe the Holy Grail ended up. Rosslyn is filled with mystery and a very heavy energy has the most ornately carved interior in the British Isles – believed to have been crafted by the first Mason (fraternal order). Guests will also visit two magnificent abbey ruins in the region – Melrose Abbey, where Robert the Bruce’s heart is buried, and Jedburgh Abbey. Then guests will celebrate the end of their Thin Places tour with a group dinner at a hotel near Edinburgh Airport. Guests returning home on this morning will take taxis to Edinburgh Airport or take a bus to Glasgow Airport to catch flights. Guests not returning home can continue their journies at their leisure from this point.